Ink Color BLACK /RED/ BLUE ETC..
Electro Pneumatic Coder are ideal for On-Line Automatic Coding on Intermittent Packaging Machines. The system is electronically synchronized with the packaging machine so that the printing is done at the instant the film stops for sealing/cutting.The message to be printed is very easily composed by just push fitting the grooved stereos (easily changeable) on to the groove base mat. 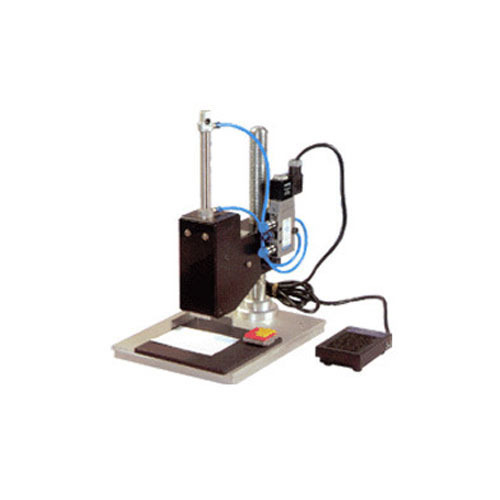 The Inking system consists of a rechargeable circular cartridge, which is fully enclosed allowing the use of fast-drying & indelible solvent-based inks for porous and non-porous surfaces. The print head slides into the housing for inking & outside for coding on to.